We created this card at the last Holiday Card Making workshop. It is cased from one of Amy Celona's holiday cards. 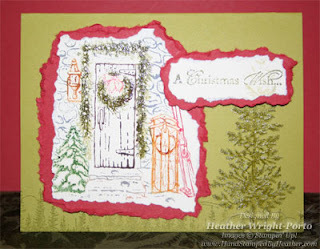 I really liked the torn look and wanted to do a card using it and the Home for Christmas stamp set. What may not be apparent is the use of clear embossing. The large tree is embossed and so are some of the elements in the image (the wreathe around the door, the small tree, the sled, the lantern, and the circle wreathe on the door). Unlike the Home for Christmas tunnel card (http://heatherporto.blogspot.com/2008/10/home-for-christams-tunnel-card.html) which was watercolored, this card uses Stampin' Write markers to "color" the stamp image. So basically nothing is colored in, everything is outlined with color instead. Kiwi Kiss, Riding Hood Red, and Whisper White card stock. Start with the Kiwi Kiss card. On the card front, stamp the small trees from the Noble Deer set in Old Olive. You can substitute by using the horizontal bunch of trees from the Lovely as a Tree set. Stamp the large tree in Old Olive Craft ink. Cover with clear embossing powder. Shake off excess. Heat with a heat gun. Use the same technique to stamp and create the greeting on Whisper White scrap paper. Then using the tearing tool, tear each side of the greeting scrap paper. Then adhere to a scrap piece of Riding Hood Red. Then tear all the edgets of the red paper (as shown in the image above) - so you have two layers of torn paper for the greeting. Set aside for now. Using the desired Stampin' Write Markers, flip over the Home for Christmas main stamp (show above) and then literally color it with different colored markers -- greens for the wreathe and trees, mustard for the sled and lantern, etc. When you have finished coloring the stamp, stamp on a larger scrap Whisper White piece of paper. Now using the Versa Mark pen, color over some of the image, like the wreathe around the door and small tree, lantern and sled. Then cover with clear embossing powder, shake off excess, and heat. Notice it really brings out the color and shines! Then use the tearing tool to tear all the edges. Adhere to Riding Hood Red paper and again tear all the sides. Adhere to the Kiwi Kiss card front. Adhere the greeting now with Stampin' Dimensionals. Last but not least, remember you can order online with ease. 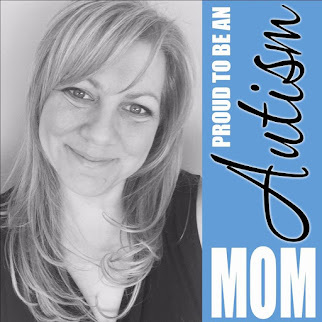 Visit my personal website: http://heatherporto.stampinup.net/ and click the SHOP NOW button. Love this card Heather!! Great colors to it. Wow… Christmas means lot's of gifts & shopping to me.